The Regional Rental Assistance Program (RRAP) is a rental assistance program that assists with access to decent, safe, and affordable housing to individuals who are recovering from a serious mental illness and have extremely low income. This program operates much like the federal Housing Choice Voucher Program also known as Section 8. 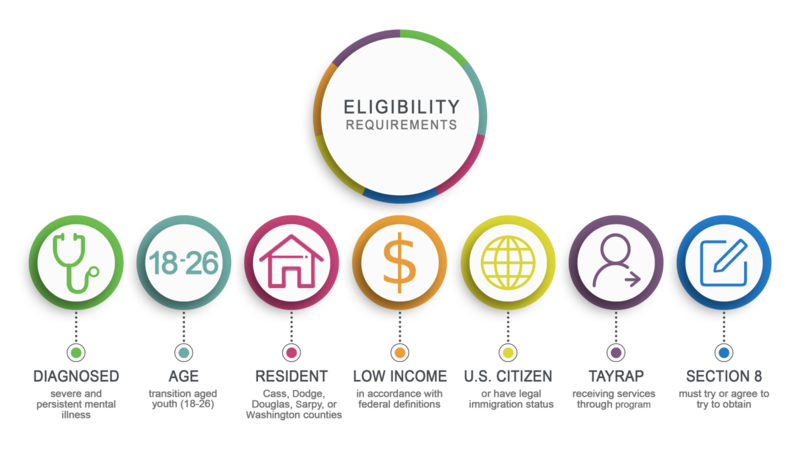 Rental assistance and (in some cases) assistance with security or utility deposits is provided to eligible participants of the Region 6 area. The Transition Age Youth Rental Assistance Program (TAYRAP) is an 18-month rental assistance program for individuals age 18-26. TAYRAP functions much like the Federal Housing Choice Voucher Program, operated by public housing authorities. TAYRAP assists young adults with independent living and the transition from youth into adulthood. The TAYRAP assisted participant or tenant is responsible for finding their own suitable housing within the geographic area covered by Region 6. The housing assistance is a transition subsidy or temporary subsidy until the participant is paying full rent or rental assistance is available to the participant. REGION 6 DOES NOT PROVIDE IMMEDIATE HELP FOR RENTAL ASSISTANCE. If you are in need of immediate assistance, please click the buttons below to visit our community partners. "Affordable housing brings stability, economic diversity, and improves the physical quality of the neighborhood." "When people have a place to live, they become better parents, workers, and citizens." RentWise is for any individual who needs rental housing, young adults moving into independent living, those in emergency shelters or transitional housing, new immigrants, or renters who need money management skills to build the credit and rental histories needed to qualify for a mortgage. This program is a tenant education program that assists renters in identifying how to find and maintain decent rental housing. Renters who complete the 6 module program earn a certificate of completion.